Located Downtown on Stanley Street, this 2-bed and 2-bath condo is 925 sq. ft. and features 9-foot ceilings, exposed brick, recessed lighting, and laminate flooring throughout. 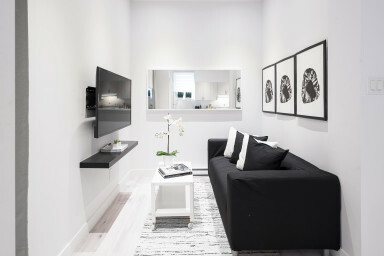 Enjoy modern design with all the comforts of home in this fully-furnished condo for rent in downtown Montreal. A bright and inviting open-concept living space is elegantly decorated with contemporary accents, offering a secluded den area with wall-mounted Smart TV, a 4-person central dining table, and a well-equipped kitchen with new appliances. Both queen-size bedrooms provide ample closet space and benefit from lots of natural light, while the designer bathrooms feature a soaker tub and luxury finish. Unit #903 also includes a complete range of high-quality linens, and unlimited high-speed Wi-Fi Internet for your added convenience. Your stay in Montreal made simple with Simplissimmo! Recently renovated and entirely refurbished, Stanley court is 4-storey residential low rise with amenities such as interior courtyard garden and shared laundry room. Serviced by the Peel metro station, with easy access to the famed Underground City, this neighbourhood is a true walker’s paradise! The Golden Square Mile neighbourhood offers everything you need from major services, name-brand shopping destinations, and popular cultural attractions, to numerous dining and nightlife options all within close proximity. Start your day with expertly-made coffee at the exquisite Café Myriad, hidden away in the stylish Club Monaco boutique, before going to explore the Montreal Museum of Fine Arts just up the street. Stop in at the Pois Penché Brasserie Parisienne for a refined bistro lunch, and then head off to Les Cours Mont-Royal or the iconic Place Ville Marie with no shortage of boutiques to choose from to suit all tastes. At night, impress a date at the stylish Balsam Inn bar & trattoria, or meet some of Montreal’s friendly locals at any one of the numerous Irish pubs found in the area such as McLean’s, Ye Olde Orchard, or Hurley’s all just a short walk away. Action and excitement are on full display in Montreal’s Downtown core, and this address puts you in the middle of it all! I had stay there for tow days and when I arrived there was everything not clean like towels some of them had dirt in them and Bed sheet had not good smell .at the same way . the sofa had like pet hair above it the big problem there when I checked out my cost was 325 they took from my creadet card 175 extra that because what they said I left the evon on but I did not they want to take other people money only. I do not gonna stay there anymore. Awesome Place in the heart of the city. It's a great looking place and close to everything. The Apartment was well maintained and equipped. Only in the early morning it was Pretty loud in the Courtyard area. Amazing very clean tidy apartment , in the heart of downtown. Honestly the Price was right and the location was great - That said the actual apartment was only far however lovable. Don't expect a palace because you'll be disappointed. When they say it fits only 4 they are right. The main TV is almost eye bulging close - The smallest bathroom door did not close. The larger bathroom had water stains under the sink and one of the towels was actually wet. All I can say here is check everything - towels - bed sheets etc. The first night someone knocked on the door to inform use they were going to have a "small party". She left her phone number and name and said if it got to loud we should text or call. WOW - it was loud - People up and down the stairs - Music thumping away - loud voices and laughter - It was actually on and off but I woke at least once an hour or more - Cigarette and Pot was the wafted through the cracks in the front door - The rest of the stay was quite enough. The court yard was not shoveled well and we had to be careful on the ice. The entrance Door to the building would scrape the cement and we thought it was a dog at first but the door made this piercing sound. It would not close fully and people would just leave it open which made the halls pretty cold. We didn't mind the three flights of stairs and the neighborhood seemed pretty safe. It's close to restaurants, stores and other sites. We went to see Mumford and Sons (which was great). The apartment is 10 minutes from the stadium. Public transportation is great and you are only steps from the subway - and not much further to buses. WIFI was good - Funny story - We hung at night and our son watched Netflix. He found the DC series Titans - When he got back to the states - No titan series - It was only released in Europe. Anyway, If you want to save some $$ so you can spend it on other things this is the place to stay. As for staying here again - nope - but as long as you go into it eyes wide open and maybe bring your towels - it's Montreal on a budget. Appartement bien équipé, lits confortables et très bien situé. Le condo était propre, moderne et accueillant. Il est situé au milieu de la ville, près du Centre Bell, alors nous pouvions nous rendre à nos destinations à pied.